Congratulations to my friend and one-time co-author Dimitry Anastakis. The Trent University business historian has been named to the College of New Scholars, Artists and Scientists of the Royal Society of Canada (RSC). 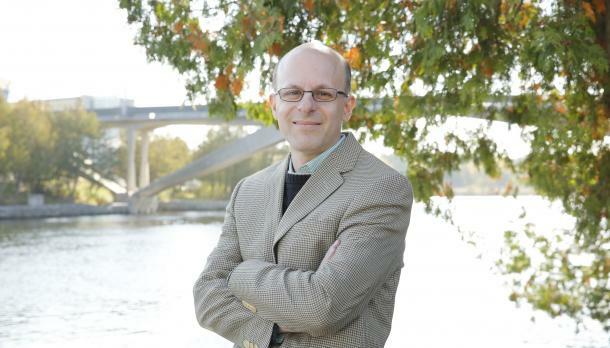 Professor Anastakis was among 48 new incoming members named to the RSC this fall. As a member, he will work with other experts from across the country to provide guidance on issues of importance to Canadians, and promote Canadian achievements in the arts, humanities and sciences. “I am honoured to have been elected to the College of New Scholars, and am doubly-honoured to be the first Trent scholar to have been afforded this recognition,” said Prof. Anastakis, who is recognized for his national and international reputation as a leading scholar of Canadian business and economic history, and his ongoing commitment to expanding the boundaries of Canadian history. Prof. Anastakis’s book, Autonomous State: The Struggle for a Canadian Car Industry from OPEC to Free Trade, released in 2013 was awarded the international Hagley Prize for the best book in business history, and the Canadian Historical Association-Political History Group best book prize, along with being shortlisted by the Social Sciences and Humanities Council of Canada as the best book in the Humanities. He has published numerous articles and chapters, and his research has been discussed in numerous media outlets including the New York Times. Prof. Anastakis also serves as the co-editor of theCanadian Historical Review, the flagship journal of his profession. The College of New Scholars, Artists and Scientists was established in 2014 as Canada’s first national system of multidisciplinary recognition for the emerging generation of Canadian intellectual leadership. It comprises a fourth entity (along with the current three Academies) within the Royal Society, which itself was established in 1882. The Members of the College are Canadians who, at an early stage in their career, have demonstrated a high level of achievement. The criteria for election is excellence, and membership is for seven years.